The Wall House by architect John Hejduk, who died last year, the construction of which had continually been put off for so long, will now finally be built. Construction company Wilma Bouw hopes to complete construction of the house in September this year. The building of the Wall House brings an abrupt end to a lengthy development process. Since the 1960s Hejduk had made several designs for houses in more or less theoretical projects. None of these designs were realized, even though Hejduk did have a specific client in mind in some cases. The Bye House, one of the projects from the Wall House series, was designed in 1973. This, like the others, seemed destined never to be built, until the news some years ago that this Wall House was to be constructed in Groningen. Over the years John Hejduk developed a close relationship with the town of Groningen. There he built his Tower of Cards (better known as The Joker), one of a series of city markers for a major festival of architecture, and he also designed a residential block for the Reitemakersrijge (which was never built). 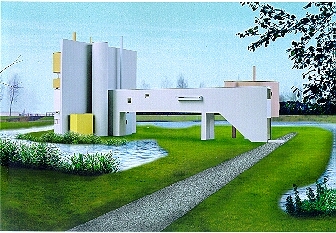 In the mid-1990s real estate agents Kamminga (developers of the southern tip of Hoornse lake) and the Groningen city authorities decided to build one of Hejduk's Wall Houses. The house was added to the city development plan, the municipality provided a site, and a building permit was issued. But the project eventually ran aground. With Hejduk's passing in early 2000, the realisation of the house, which Hejduk himself had attached great importance to, seemed further away than ever. But now it looks as if the Wall House will finally be built, and very soon too. Construction firm Wilma plans to complete work on the house in September for the start of the Blue Moon event. The Wall House will thus give added interest to this festival of culture and architecture. The house is being built on a 1750m2 site on the edge of the Hoornse lake. Architecture firm Otonomo is in charge of its realisation.